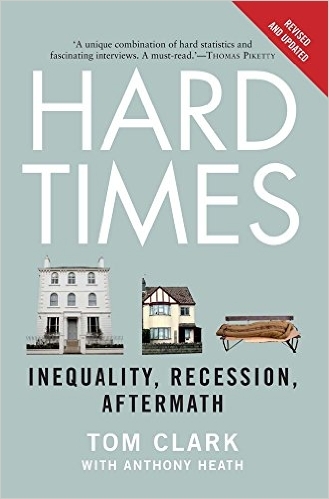 In Hard Times: Inequality, Recession, Aftermath, Tom Clark offers a potent exploration of growing inequalities in US and British societies, contributing to the work of other leading intellectuals such as Thomas Piketty, Tyler Cowen and Robert Reich. Florian Bon argues that Clark looks beyond seemingly glowing statistics testifying to economic growth to examine the ‘social recession’ and resultant ‘hard times’ experienced in the aftermath of the financial crisis. Hard Times: Inequality, Recession, Aftermath. Tom Clark with Anthony Heath. Yale University Press. 2015. While many commentators extol the virtues of the British approach to capitalism – the United Kingdom having topped up an impressive (by European standards) 2.8% rate of growth in 2014 – Tom Clark’s dazzling new book, Hard Times: Inequality, Recession, Aftermath, offers a powerful reminder that statistical clarity can often hide a much more dire reality. In this Sherlock-Holmes-style of evidence-gathering investigation that drew on the research of a Harvard-Manchester initiative led by Anthony Heath, the Guardian columnist unveils the divisive effects of the last recession on US and British societies. Mingling hard statistics and captivating, often poignant, interviews, Clark analyses the ‘selective path of destruction’ the recent financial storm has dug and the ‘social recession’ it has created. In the wake of vast academic research on growing inequalities carried out by leading intellectuals such as Thomas Piketty and his Capital in the Twenty-First Century (2013), Tyler Cowen and his Average is Over: Powering America Beyond the Age of the Great Stagnation (2013) or Robert Reich excoriating the ‘perfect storm‘ of US democracy, Hard Times’s central idea is that gleaming numbers can conceal the big picture. Clark’s main finding is that, as nations become more and more unequal, political opinions emerge as more and more polarised, in a way that could jeopardise their very social contracts. Despite reassuring unemployment and growth rate figures, budget cuts, joblessness and economic anxiety have profoundly eroded social cohesion. With Hard Times, we thus learn that the overall rate of absolute poverty in the US has grown by 43% between 2000 and 2010 and that food habits have deteriorated severely along with the fall in real income. We discover that the official unemployment rates are just one side of the story (part-time jobs and underemployment having skyrocketed since 2008); that social mobility is stalled; and that we are getting closer to a Great-Gatsby-style Gilded Age. We also find out about the devastating effects of joblessness, being laid-off drastically reducing volunteering and civic membership involvement and increasing marital conflicts. We hear the story of ‘Winston’, a 47-year-old jobseeker from Stanmore having to budget his weekly meals on a £10 basis, and many others. Clark’s main added value is that he shows the extent to which economic downturns have become extremely selective over the years, striking above all the laid-offs, the young and ethnic minorities. Young people graduating in hard times will face ‘large negative wage effects’ throughout their careers that will never vanish. Clark draws up an outlook of the permanent scars a recession can inflict on a society’s most vulnerable citizens. Being laid-off one single time at any point in your career will leave you less trustful of your peers, more anxious in your work, less involved within your community. One of the book’s great qualities, in addition to its academic rigour, is that it reveals the existence of two (or more) nations within Britain and the US by portraying the impact of local labour markets on socio-economic prospects for individuals. As Enrico Moretti has shown in The New Geography of Jobs (2013), Western countries (and particularly the United States) are becoming more and more geographically segregated. This precise insight shows that ‘hard times’ do not strike with the same magnitude in ‘depressed Blaenau Gwent in Wales’ as in ‘Surrey in Britain’s stockbroker belt’. Growth dividends are to be more and more found within large cities from which the poor are gradually priced out, a phenomenon well described by the Financial Times journalist Simon Kuper and by Harvard University’s urban economist Edward Glaeser. Clark is neither the first to mix meticulous social science analysis with public policy recommendations, nor to warn us about the growing discrepancies within Western societies. Charles Murray’s Coming Apart: The State of White America, 1960-2010 (2012) already put in evidence that the American social fabric was split into communities with completely different core behaviours and cultures. In 1933, George Orwell, in Down and Out in Paris and London, wrote a detailed account based on his own experience of the rampant spread of extreme poverty in both cities. But Hard Times‘s cardinal quality lies in its focus on the economic consequences of drifting well-being, a subject recently tackled by the Organisation for Economic Co-operation and Development (OECD) How’s Life 2013: Measuring Well-being index, which has been largely ignored by the mainstream analysis of the last crisis. As a pamphlet against the trickle-down economics dogma that undermined deep-rooted societal solidarities, Hard Times proves convincing. Clark delves into the minimum wage battle and into the legacy of Chancellor George Osborne’s austerity policy with the recent cap on housing benefits and the announced reassessment of disability allowances. The US’s and Britain’s political elites find no favour in Clark’s eyes as he clearly advocates that ‘for several decades before the bust, public policy was actively working to ensure that the rising economic tide did not lift all boats’. If weaknesses were to be found in Hard Times, one would perhaps mention the fragility of its last chapter, dedicated to the author’s own conceivable solutions to ‘the storm’. While he criticises the large cuts in the British welfare state’s safety nets as well as recognises the impact of an ageing society on the latter, Clark does not come up with fresh alternative ideas to pay for the financing gap or to cope with the evolution of the old-age dependency ratio. John Micklethwait and Adrian Wooldridge in their book, The Fourth Revolution: The Global Race to Reinvent the State (2014), proved more innovative in this respect. He could also have mentioned the selective effect of the computerisation of a growing number of occupational provisions. Even if Clark’s work was not designed to be projective, a mention of this expanding factor of societal divergence within Western societies might have been helpful to understand the full extent of the current ‘hard times’, and the erosion of societal cohesion that comes with them. Florian Bon graduated from a top French business-school – ESCP Europe – with a specialisation in Finance and is currently completing a Masters in International Economic Policy at SciencesPo Paris, while serving as an intern in the French High Council of Public Finance, an institutional body scrutinising the macroeconomic forecasts of the government and the trajectory of its public finances.